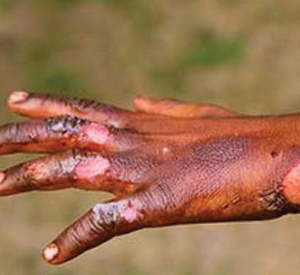 An average of 32 burns were reported during each month of 2012, from a low of 24 in February 2012 to a high of 46 in July 2012. Scaldings caused the most burn injuries during all 12 months of the year. Massachusetts is famous for the advanced medical treatment that its hospitals offer to burn and trauma victims. It is also famous for developing strict fire safety codes. These safety advances began largely after the deadly 1942 nightclub fire at Boston's Cocoanut Grove, which was Boston's "it" nightclub during the 1930s and 1940s. In 1942, on November 28, the club was the site of the deadliest nightclub fire in US history. It killed 492 people and injured hundreds more. Yet despite fire safety advances since then, fire tragedies on a massive scale can still occur. Just ten years ago, there occurred another devastating fire that made national headlines: The Station nightclub fire in West Warwick, Rhode Island, which was the fourth deadliest nightclub fire in United States history, killing 100 people. The fire started shortly after 11PM on Thursday, February 20, 2003, and was caused by pyrotechnics that ignited flammable sound-insulation foam in the walls and ceilings that surrounded the stage. In less than 5 ½ minutes, a devastating fire engulfed the club. Aside from the 100 fatalities, 230 people were seriously injured and luckily, another 132 escaped uninjured. These tragic events illustrate that burn injuries can happen despite "modern safety advances." And when they do, victims of these events need the services of an experienced Boston, Massachusetts burn injury attorney. Our firm and our lawyers know precisely how to obtain maximum damages for our burn injury clients. Contact our offices at Ph. : (781) 320-0062 or Ph. : (617) 285-3600, or click here to send us a confidential email to discuss your burn injury. We offer all of our legal clients a FREE INITIAL CONSULTATION of up to 20 minutes and you will pay absolutely NO FEES unless we win your burn injury case on your behalf. What types of accidents cause burn injuries? They can result from automobile accidents, work or construction site accidents, defectively-designed or defectively manufactured motor vehicles, or by a fire in an apartment or building, especially where exits are blocked. Burn injuries are some of the most devastating injuries that a person can suffer, and people affected with serious burn injuries require not only the most advanced medical treatment available, but experienced and aggressive legal representation. Let's look at some of the more common causes of burn injuries. Construction workers, truck drivers transporting flammable materials, and roofers face a high risk for suffering burn injuries. How so? Construction workers operate dangerous and flammable equipment, especially torches, which may not be properly maintained. Roofers face enormous risks from the burners and hot tar they use in adhering shingles. As a result, employers have an obligation to ensure that their employees work in safe environments. They must keep equipment maintenance logs, put a limit or cap on weekly hours worked, and make sure the job site is safe. Otherwise, employers, in Massachusetts, for example, they can be held liable for Massachusetts construction site accidents. Gas explosions can cause not only death but some of the most severe burn injuries. That's because victims are often trapped inside a structure or equipment when an explosion occurs. These accidents can happen in a private home, at work or on a construction site. Common causes? An excavating or digging contractor may negligently strike a gas pipeline while on the job. Propane gas tanks can leak undetected gas, and all it takes is the slightest spark to create a deadly explosion. Individuals killed or injured in fires may be victims of having been trapped in the fire by a property owner's failure to maintain safe, adequate fire exits (as always required by state and local building codes). The property owner has an obligation to maintain a safe environment, no matter if it is a workplace, restaurant, nightclub or apartment building. If a building or structure does not meet state and local fire safety and building codes, people run the risk of suffering devastating burn injuries, or even wrongful death. And when someone suffers a serious burn injury, the victim is not the only person affected. The stress on families and other loved ones dealing with a burn injury can be overwhelming, both financially and emotionally. We want you and your family to focus on your well-being and recovery, while as a Boston burn accident law firm specializing in these injuries, we deal with the legal issues involved. Each member of our legal team will interface with the doctors, hospitals, medical billing companies, employers, insurance companies, and investigators, to secure for you the financial damages that you deserve. We will be your legal bodyguards, and we will fight for you, and the future financial well-being of you and your family, during a painful and difficult time. One thing that Big Business and the insurance industry have done very effectively, is trumpet the "McDonald's Coffee Case" as an example of how most lawsuits are "frivolous." They effectively portrayed this case to the media as nothing more than a consumer who some spilled coffee on herself, while she was driving her car, and then was paid "millions of dollars" after suing McDonald's for negligence. Almost all of this is false. If you want to see the truth of this story, see the HBO film, "Hot Coffee": http://www.hotcoffeethemovie.com. It will wake you up more than any amount of caffeine can - hot or cold. We will use all of the legal, medical, financial and investigative resources that we have, to effectively ascertain what caused your accident, identify those responsible, and hold them accountable to you for their actions. If you are a burn injury victim, you may be able to bring claims against numerous parties, depending on the circumstances of your injury. For example, if your child has been burned while being supervised by a babysitter, school, or daycare provider, those parties may be held responsible. Or, if you are in a car that explodes after an accident, causing your burn injury, the other driver and his insurance company can be held liable - as well as possibly the automobile manufacturer and designers. Property owners can also be held responsible when fires occur in restaurants, homes, workplaces and nightclubs. A number of various factors will determine this, such as: If the burn injury was due to a fire, was the property where the fire occurred in compliance with local and state fire safety codes and building codes? If in a commercial establishment, were sprinkler systems up to date and operational? If the victim was scalded in a restaurant, was restaurant equipment defective or were employees negligently supervised? If the injury occurred in someone else's home, was there evidence of some type of negligence or inattention on the part of the homeowner? In all cases, regardless of what caused the specific burn injuries, one of the most important questions will be: Was the accident reasonably foreseeable to the owner of manager of the property? If you or a family member has suffered from a burn injury, after your medical care has been stabilized, you should contact an experienced Boston Massachusetts burn injury law firm. Remember, a Statute of Limitations applies in these cases, so it is important not to wait too long before consulting with a Boston Massachusetts burn injury lawyer. Investigations need to be begun; witnesses need to be interviewed, evidence needs to be preserved. The more time that passes before this process is begun, the harder it is to maximize potential damages and financial recovery. For more practical and important information regarding your injury, click here to receive our FREE article "The Top 10 Things To Do After Suffering An Accident Or Injury In Massachusetts." This document offers necessary information for a variety of Massachusetts injury victims. It discusses the legal steps recommended after you or your loved one suffers an injury due to someone else's negligence, including a Massachusetts burn injury. You'll discover information about how to best protect you or your loved one after suffering a personal injury, and how to go forward following such an incident. The fact that you are reading this web page, now, is an action step in the right direction to preserve your legal rights to receive compensation for your injuries. The Law Offices of William D. Kickham has worked with many personal injury victims, and is highly experienced in the legal strategies needed to maximize your financial recovery. While our offices are conveniently located off Route 128 in Westwood, and in Boston , we also travel to your hospital, nursing home or private home, to assess your legal situation. You will pay absolutely NO FEES unless we win your burn injury case on your behalf. Contact us at (781) 320-0062 or (617) 285-3600 or click here to send us a confidential email to discuss your burn injury. We offer all of our legal clients a FREE INITIAL CONSULTATION of up to 30 minutes and will respond promptly to your call or email about your injury. Have you heard of Massachusetts injury lawyer William D. Kickham? He is a distinguished legal commentator for local and national media, including Court TV (now In Session on HLN,) Fox News TV-25/Boston, The Boston Herald, WBZ-AM Radio 1030, WCVB-TV5/Boston, Nightside With Dan Rea, Greater Boston With Emily Rooney, Money Matters Radio/Boston, and The Metro Newspaper/ Boston.